When people think of revolutionary self-organizing and action, they probably don’t think about West Virginia. But the region has a deep history of violent confrontation to the bosses and corporations that profit from coal and destroy workers and the environment in the process; from the “Mine Wars” of the early 20th Century, to the recent fights around Mountain Top Removal. In many ways, the Morgantown Ultra-Left Network (MULN) continues on that tradition in West Virginia, which is located in the area of the so-called United States known as Appalachia. MULN was formed at first as a group based on the Morgantown campus, but over time has evolved into a crew that is involved in a variety of projects and struggles in the wider area. 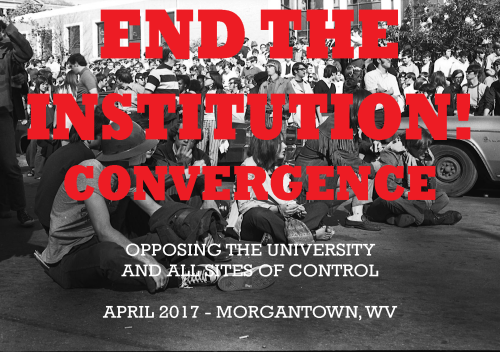 In April of 2017, they are also putting on a conference and convergence entitled, ‘End the Institution: A Call to Come Together Against the University.” In this episode, we talk about how the university serves as a place where capitalist society is reproduced and why people would want to take on an abolitionist stance towards higher education. We then switch gears and talk about the recent election of Donald Trump and our MULN participant discusses their thoughts on the uphill battle for anarchists in the coming period. We touch on the white working class, the pitfalls of ‘populist’ politics on the Left and Right, and also how their area of Appalachia provides challenges and opportunities for organizing. Overall, this is an engaging interview about revolutionaries taking action in a place most people don’t even know about, and in a setting that has a deep and radical history. Music: Harry McClintock and Appalachian Terror Unit.